Do you like The Great Escape? Share it with your friends. 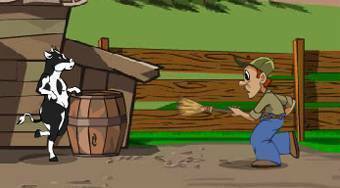 Try out a game from the world of farming, which will surely entertain you. The main heroine of the game is a pied cow, who will gain your sympathy soon. Try to gather enough calcium in each level. Do not let yourself be caught by watchful farmers and dogs. Be very careful, as traps await you literally on every step!